Chaukori is A Tiny Hill Station In The District Set Among The Lofty Peaks, Of The Western Himalayan Range In The Kumaon Division Of Uttarakhand, India. To The North Is Tibet And To The South Is Terai. The Mahakali River, Running Along Its Eastern Boundary, Forms The Indo-Nepal International Border..
Chaukori's Elevation Is 2010 M With A Spectacular View Of The Snowy Peaks Of Peaks Of Nanda Devi, And Nanda Kot. It Is Approximately 10 Km from Berinag, Another Little Hill Station. Chaukori Is A Place Where One Can Sit Whole Day Without Any Company To See And Enjoy The Beauty Of Mountains Full Of Glaciers Within A Eye Distance And Can Feel That The Snowly Winds Are Touching Smoothly. 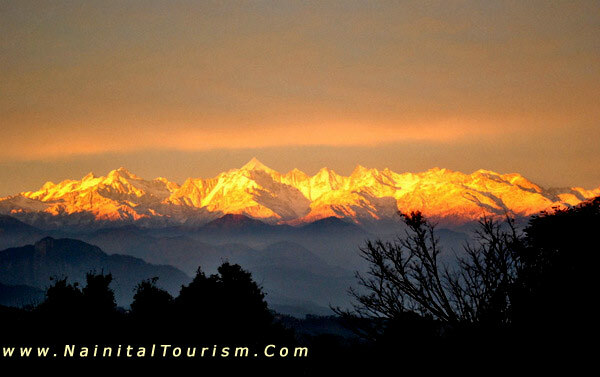 One Can View The Snow Clad Peaks Of Chaukhamba, Trishul, Nanda Devi, Nanda Kot And Panchchuli In Their Pristine Glory. Choukori Having A Wonderful Climate And A Beautiful Location. Chaukori Offers A Magnificent View Of The Panchchuli Peaks And Has Few Rivals For Spectacular Himalayan Sunrises And Sunsets. Chaukori Is The Ideal Destination If You Want To Experience Serenity And Solitude Amidst The Lap Of Nature. Chaukori Offers Most Magnificent View Of The Himalayan Peaks Like Nanda Devi, Kedarnath, Chaukhamba, Trishul, Panchchuli And Nanda Kot And Has Few Rivals For Spectacular Himalayan Sunrises And Sunsets. 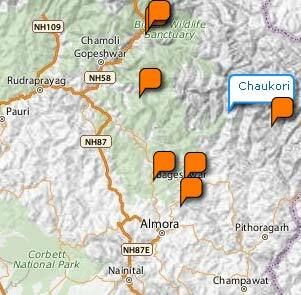 In Chaukori Forests Of Pine, Oak And Rhododendron Are Interspersed With Cornfields And Orchards. The Climate Is Conducive To The Growth Of Tea, Been Cultivated By Locals. Gangolihaat :- (35 Kms). An Important Religious Center Housing The Famous Hat-Kalika Temple, Which Is A Popular Venue For Local Fairs. Berinaag :- (8 Kms.) Offers A Panoramic View Of The Himalayas And The Tea Gardens Here, Yield High Quality Tea. Patal Bhuvaneshwar :- (49 Kms.) Situated On The Road To Berinag, From Gangolihat, The Patal Bhuvaneshwar Temple Complex Is Worth Visiting. Inside The Cave, Many Indian Myths Have Been Immortalised By Limestone Formations. Lime Formations Have Taken Various Shapes Identifiable As Shesh Naag, Ganesh, Badrinath & Kedarnath, The Wings Of Jatayu, Sumeru Mountains, Kaam Dhenu, Garur, Jyotirlingas, Shiva’s Chaupar’s Etc. Dharamghar :- Situated 9 Km From Chaukori, This Is Where Sarla Behn, The Disciple Of Gandhiji, Spent Her Last Days. One Can Enjoy A Spectacular View Of The Himalayan Peaks From Her Abode Called As Himdarshan Kutir. Chaukori Is A Picturesque Destination Affording Enchanting Views Throughout The Year. The Best Time To Visit Chaukori Is From April To June And From Mid September To October End. Summers In Chaukori :- The Weather Of Chaukori Remains Salubrious During Summers And You Can See Unobstructed Views Of The Himalayas. Chaukori Remains Pleasant During Summers And Light Woollens Are Required. 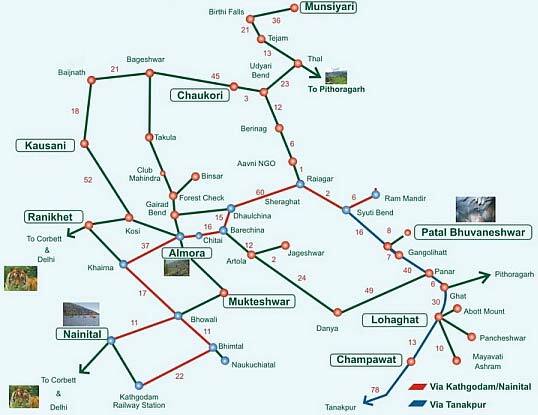 It Is Probably The Best Time To Visit Chaukori.